Standing up to keep fossil fuels in the ground, and to protect water, culture, and indigenous rights is multisolving. Multisolving – the search for systemic solutions that protect the climate while delivering other benefits – prioritizes actions that produce multiple benefits. Our library of multisolving examples offers dozens of examples of policies and investments that do just that. Multisolving is rarely easy. Our research has shown that multisolving often requires the formation of new relationships between constituencies or the drafting of new policies or the establishment of new investment guidelines. Multisolving rarely happens overnight, but the results, measured in tons of greenhouse gases abated, environmental quality improved, and human health protected, are well worth the effort. 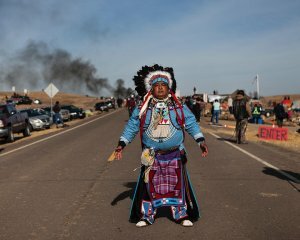 The peaceful and non-violent Water Protectors from the Standing Rock Sioux and other tribes are in the news right now as they stand against the Dakota Access Pipeline. Their example demonstrates that sometimes multisolving also requires physical courage and sacrifice. In their actions to halt the construction of the pipeline, the Water Protectors are simultaneously defending cultural and ancestral sacred sites, protecting water from pollution, and keeping fossil fuels in the ground, protecting the climate for future generations. Climate science says we need to leave fossil fuels in the ground. Ethics and law say the United States and North Dakota need to respect the treaty rights of tribes. And all of us depend upon and have a right to fresh clean water. Analysis has shown that protecting indigenous land rights is one of the most cost effective ways to protect ecosystems and the climate. With powerful vested interests determined to take extreme measures to bring fossil fuels to market, ensuring the rights of indigenous people is both an urgent priority and a moral imperative. You can learn more about the Water Protectors, their efforts, and the kinds of support they are seeking from the websites of the The Indigenous Environmental Network and The Sacred Stone Camp.